Samsung has started pushing out a new update to its Gear S2 smartwatch. Arriving as build number XXU2EQJ2 and weighing in at 22MB, it's not a big update, but does bring along some optimizations aimed at increasing the battery life. In addition, the update also includes some security enhancements. 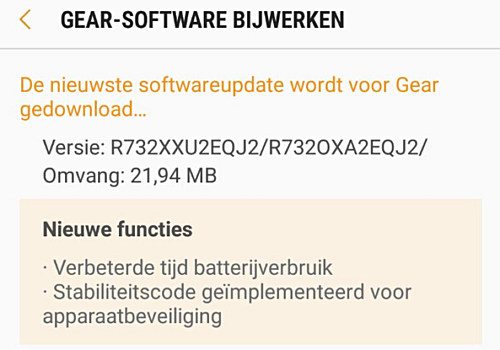 Currently, units in Europe (the Netherlands to be specific) are getting the update, although other regions should get it soon as well. As is usually the case with OTA updates, it may take time for the update notification to pop up on your device's screen, so be patient. Haha, thanks for the laugh. And your reasons are? again, in the morning I toke my gear from charger, after 15hours of use it left just 43 percents... as usualy it was abaut 65 percents, the bigest batary eater is shealth 16% hmmm should I reset my watch?